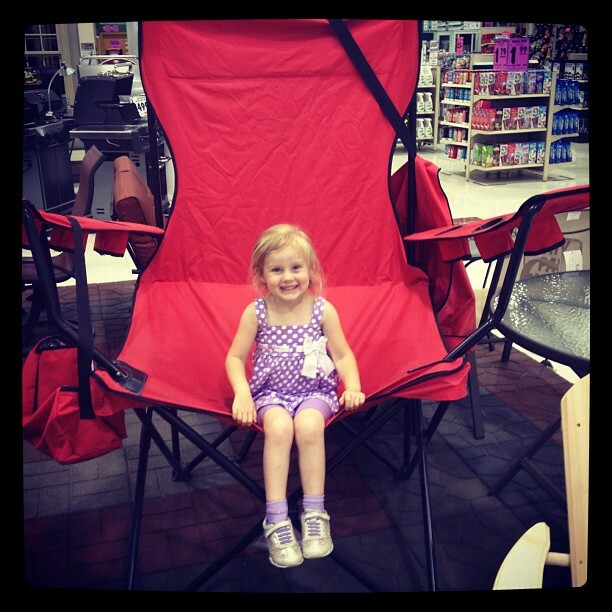 Ellie in a chair made for giants! I am now almost seven weeks pregnant! Yay! I announced it pretty early I guess - most people wait until later but I didn't want to wait. I can see why people would choose to do that but I decided not to. The kids are very excited about having a new baby "brudder" (or sister...but "brudder" is the preferred choice at the moment apparently) and so far things are going pretty well. It seems like everything started earlier this time - the morning sickness, the exhaustion, little aches and pains...but oh well. Signs of a growing baby! (Or perhaps babies...several people have suggested it could be twins since I had symptoms much earlier! Ha! We shall see.) I've also had some motion sickness which is weird to me because I've never had motion sickness in my life! We found out not too long after I announced my pregnancy that my husband was no longer going to have a job at the end of July because the company was getting rid of his position. Yes, unemployment - AGAIN! (If you're new to the blog, we've been through job loss twice - well three times now - because of the economy. You can read more about it here.) He and I were both very discouraged and I was slightly panicked...but I knew it would work out like it always does. We prayed continually that something would work and that he wouldn't be stuck looking for a job for months. Hubby has kept in contact with some of his previous work colleagues and just a week or so ago, he got a call from the place he worked before offering him his old job back! How awesome is that?! Granted, it was the place that he worked a *lot* of hours and it's much more of a commute but I'm not going to complain - it's a job, a good job! In other hubby news, he deserves a medal of bravery for having his teeth worked on this week. Tooth problems run in his family - however, only certain members of his family have been affected by it: so far it's just him, his mother, and one of his uncles. Even though he's taken excellent care of them, his teeth just began to erode and break down, and he's gotten numerous infections and abscesses He's been getting them patched up over the years but was told awhile ago that he would probably end up having to get them all pulled like his mother and his uncle both did. So this week he had 15 teeth extracted and a top denture put in. They kept some of his bottom teeth that are still good and he's going to get a partial for the bottom after he heals up. His teeth look AMAZING. I know the process had to be incredibly painful but when it's all said and done he's going to feel so much better. June was a super-dee-duper busy month for us...as in, I haven't been that busy in a long stinking time. We had a lot of special events going on - a wedding, family visiting, a weekend away that I still haven't written about, and lots of activities for Mister Zeke. He finished up his baseball season the second week or so of June and I am so glad - I can't imagine sitting in the direct sun at his games on a week like this week! (106 degrees anyone?) He also finished up his swimming lessons and I'm really glad we put him in them - he learned a lot and he's much more confident swimming in our pool now. The week after that he went to 4H Camp during the day and had a really great time there. He brought home all sorts of neat projects & crafts he worked on and sang me some very silly songs. And the end of June brought to us the 4H Fair in which Zeke did Bicycle and Weather projects. An acquaintance told me that it was silly to get him involved in all those activities and to them I say "Bah Humbug." Yes, I was tired and did over plan our schedule a little for that month but Zeke really enjoyed and benefited from all those activities. Our bedroom got a redo after hubby got a set of furniture at an auction for a super good price! Our room looks much bigger than it did before and we have so much more space for stuff! I also went bargain hunting at town wide garage sales with the kids and my Mom one Saturday afternoon and found this table and chairs for $20! I couldn't believe it. My BFF has asked me to be with her when she has her baby and I couldn't be more excited. She and I are very close and I'm honored that she asked me to be in attendance. I've never been a birth partner before but am very much into childbirth, have (obviously) given birth twice before and have watched many birth videos. They always make me teary-eyed and I'm going to try my best to not be a big bawling bag of tears...no promises though as I am also pregnant now too, haha! Any day now we'll be whisking off to the hospital and meeting the new little man! We are starting school this coming week so I have been busily planning away and making a general schedule/plan of what I would like to accomplish for the next school year. Taking June off helped us to have a little break (well, as much of a break as you can have when you've got seven thousand activities planned...hee hee) but that doesn't mean we've stopped learning. We've been reading books together, Zeke's been working on tying his shoes & studying his globe, and I've started some very simple voice and piano lessons with both him and Ellie. He's been asking me when we're going to start doing schoolwork again which I take to be a good sign! Well, I think that's everything that's been going on with us...hopefully I'll be able to keep things more updated in July. :) Be sure to follow me on Twitter if you want to keep up with me as I usually check in and/or post on there several times a day.